REIKI master in the Usui system of Reiki from LS Reiki Alliance USA. Teacher of Hatha and Raja Yoga. Director and Teacher of The Silva Mind Control, USA. Director and Teacher of the New Silva 2000, USA. Instructor of Clinical Hypnosis and Hypnotherapy from USA. Licensed Trainer of NLP, from the NFNLP, USA. Licensed Practitioner of DHE, from the Society of DHE, USA. Personally trained in "Motivation and Empowerment" by Anthony Robbins. Creator of the Internationally acclaimed Mind and Psychic Development workshop "The Fourth Dimension", other programs are Money Mind, Super learning etc. Teaching and training since 26 years, Trained Thousands from all walks of life. Conducts workshops and programs in USA, India, Singapore, UAE and USA. Award winner of the "Best Instructor of 1997" by the National Guild of Hypnotists, USA. Over 400 workshops, seminars, lectures and training programs conducted. 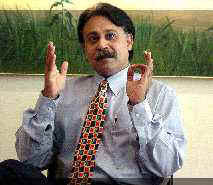 Considered an authority on MIND SCIENCES, in Pakistan and abroad. Interviewed by Doordarshan, Zee television. Also appeared in various TV programs such as Saweray Saweray, Farozan, Awami Forum and Karobari Duniya. Prof. Dr. Moiz Hussain has delivered Lectures, Workshops & Seminars on various aspects of MIND DEVELOPMENT to various organizations. Click on the Button below to see the list of all the Organizations. Most Powerful Mind And Psychic Development Program. Do you want to Contact guru?? ?